Faster Code. Find alternative ways to common queries that get the same result, only faster. Examples of Each Tip. Explanation of each tip, including examples of using the tip, to make it easy to understand and put into practice. Features to Avoid. An explanation of features to avoid in Oracle SQL if you want to improve your queries. Suggestions to improve your SQL formatting to improve readability and make debugging easier for yourself and other developers. Several tips on how to improve the efficiency of your queries, such as how and why to use "bind variables". Ways to write your code to make it easier to maintain in the future, either in your current project or years later by other developers. Your company will thank you for it. Many tips on how to design better queries, which run faster and are easier to read. Do you want to improve the quality of your SQL queries? Don't let your SQL be inefficient any longer. Get a copy of this guide today. Don't wait any longer. 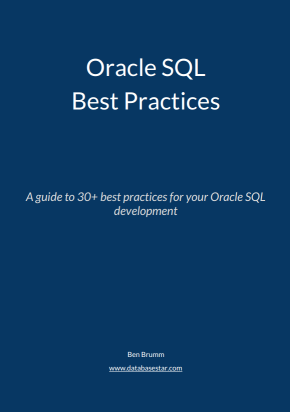 The sooner you start reading this guide, the sooner your SQL queries will improve.